We haunt a preview showing of Ubisoft’s next ultra-military four-man squad-botherer, then trade Qs and As with Product Manager Aziz Khater. 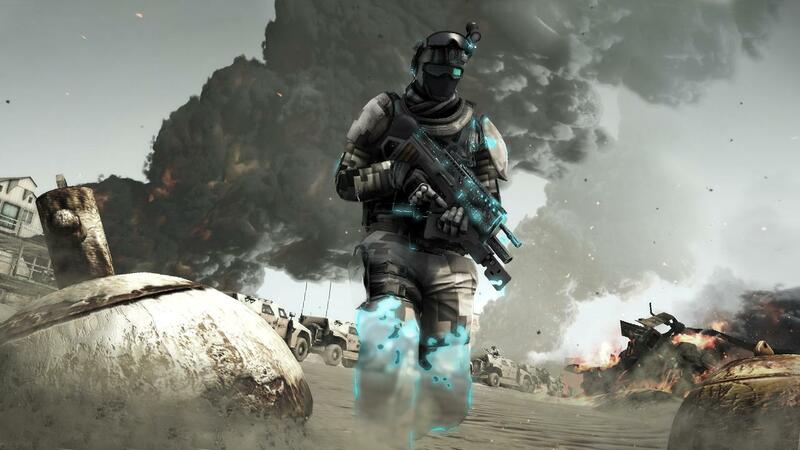 For many first-wave Xbox 360 buyers, Ghost Recon: Advanced Warfighter was the game that scored the line between hardware generations the deepest, with its snazzy in-set video displays and billowing high resolution dust. Critics certainly thought so, and the game went on to pull Best Game at the British Academy Video Game Awards, joining Half-Life 2 and Grand Theft Auto in the heavily shelled foxholes of history. Advanced Warfighter 2 wasn’t quite so explosive a release, though warmly received, lacking the caricatured allure and online robustness of younger shooters like the omnipresent Gears of War. A little more time in the incubator seemed requisite for the next iteration, and Ubisoft duly took the franchise back to formula. Future Soldier, the result of those few years in retreat, doesn’t so much attempt to think round the attritional mindset behind much present-day tactical action as think through it, borrowing a stealth camo suit from Metal Gear Solid 4 in order to slide under the skin of enemy formations that might, otherwise, be so much cover-shooty precision-aim fodder. The demo we were shown at a recent Ubisoft event in London balanced the finding, fixing and flanking of yore with tip-toe sallies right under the noses of your opponents – not to mention behind their backs, and over their cold dead bodies. Look, his legs are all see-through. While such important details as squad control and the precise effectiveness of that invisibility cloak are still open to speculation, the new game’s distinctiveness is palpable. Prior Ghost Recons were the product, despite their sneaky moments and non-linearity, of a more conventional school of war, two rows of soldiers firing at each other from shelter; Future Soldier is about going anywhere undetected and concentrating all the resources of a superpower on a very small area, such as somebody’s jugular. It’s the difference between levelling a house by firing a bazooka at it and planting remote charges on key internal supports. Product Manager Aziz Khater was on hand to discuss the game after our demo. He said interesting things and stuff. Read them below. 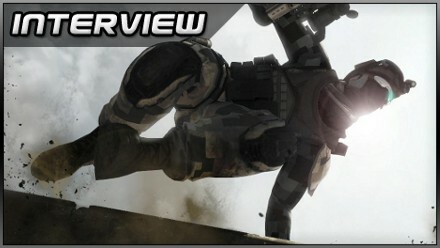 VideoGamesDaily: Ghost Recon has been relatively invisible (rather appropriately!) for a few years. How has the franchise evolved during its time away from the public eye? Aziz Khater: We tried to gather the feedback of our core consumers first. In this new version we tried to keep what pleased those guys, so the very roots of the game – tactics, lots of reflection before acting, etc, not just running and shooting everywhere. We also have to look at the new standards of the market, you know – obviously Call of Duty, which is a very good product, we all know it, we liked it too. So we tried to mix what was the basic essence of our game and tried to include some new action phases, you know, and we tried to have the guy shooting on real people instead of Intel you know, we all think that it’s much more fun than that – you’ve seen in the demo, the distances are more close. So it’s not about shooting from long range, even if it happens in some places, just like the sniper one. We really wanted to have the guys feeling under pressure, just like being behind enemy lines. The exact role of these mechs - another element redolent of MGS4 - has yet to be confirmed, but our guess is: lots of firepower. So you were trying to get away from the long-range, peek-shoot mentality in particular? Yes, yes. I’ll try to mimic one of the sentences our creative director says – we [don't] just want the player to do his homework, to say ‘OK, you go there, you go there, you do that’, and then watch the thing happen, what we really want to do is give to the players the feeling of being in the middle of the battlefield, and having to deal with it, and giving orders. Even with one shooting, you have to say to the guy ‘OK, move there, bang bang’… you’re going to see it in the solo campaign, if you play alone we have a brand new system of orders which we think work pretty well when you’re under fire. 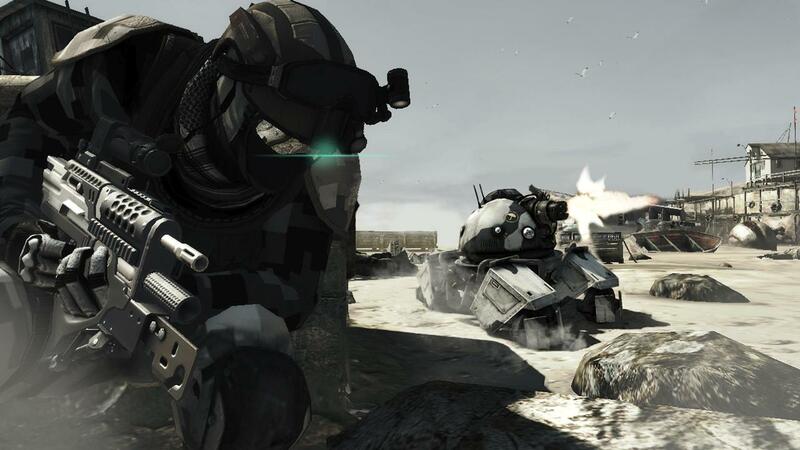 Back when the Xbox 360 launched, Advanced Warfighter was one of the bigger multiplayer titles on offer. Nowadays Call of Duty is the gold standard in that department. How have you changed things to make your game relevant again? It’s a thing I can’t talk about right now, but be sure that you’re going to find all the classic modes that you could find in Ghost Recon, but also in the new competitors for multiplayer modes. It will be eight versus eight online. One of the big things we wanted to add to this game was a four-player co-op, now the full campaign will be playable with four people. 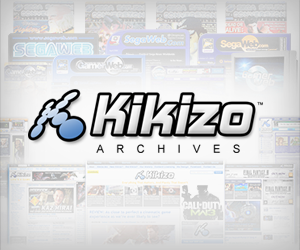 Posted in Interviews, Previews, Spotlight, Top 5, and tagged with co-operative, Microsoft, nintendo, PC, PlayStation 3, Sony, tactical shooter, third-person, TPS, Ubisoft Paris, Xbox 360. That’s a really neat interview, very interesting I love the “behind the scenes” stuff.